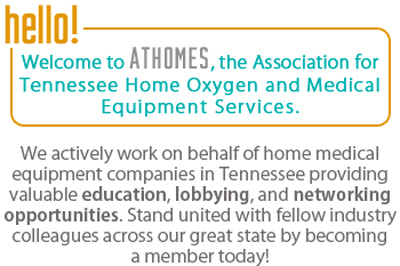 We're MOVING FORWARD in Tennessee as an exclusively HME-focused association dedicated to advocating, educating, and protecting your company and the people you serve. Every member whose e-mail address is recorded on the web site can obtain or change their password at any time by entering the e-mail address in the member’s log-in box near the upper right hand corner of the home page, and clicking on the words “Forgot password” under the lower box. Then just follow the directions to set a password of your choosing, and use that e-mail address and password to log in. ATHOMES Members with Rep. Marsha Blackburn in Washington, D.C. From left Jeff Carr (Carr Rehab), Rep. Marsha Blackburn, Ashley Plauche and Randy Wolfe (Lambert's Healthcare), James Herren. We are all too familiar with the threats facing our industry, including competitive bidding, audits and reimbursement cuts. ATHOMES enables suppliers to unite to make a difference. As one founder said, "Every supplier in Tennessee needs to be active and contribute time and resources toward protecting out companies and our industry. There is strength in numbers, and now is the time to prove it!" Our industry needs accessible, effective leadership that focuses on developing the relationships and strong political connections that will be required to help shape legislative and regulatory changes, and to keep industry members informed, both as to what needs to be done, and how to do it. On Facebook? Follow our breaking news!